There is one line of equipment that the professionals demand for rugged dependability and the highest quality, and that is Stihl. And Kramer Ace Hardware offers a full line of their equipment in our Clear Lake, IA location. Our full line of products is in stock and ready for you to make your selection. If you demand quality, dependability, and fair pricing then stop and see our team of sales professionals. More than chain Saws! Mention the name Stihl and you are sure to hear the response, “The best chain saw on the market!” But there is more to this line than a great chain saw. Take for example this leaf blower, not only can it move those leaves around the yard and out of the shrubs, but add a gutter kit and clean them effortlessly. This blower offers the same Stihl quality and all the features you need for great clean ups. 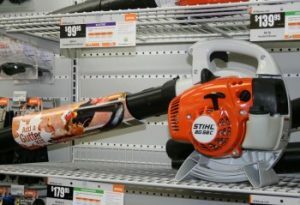 When you buy a Stihl the quality is built in and not just a name applied to a generic machine. If all Stihl had to offer was the best engineered and manufactured chain saw on the market we’d be just as proud to represent them. But they also have a full line of accessories to complete your project and we have them stocked in our store for your consideration. Once you have made your choice of the equipment to fit your needs we will have your equipment serviced and ready to run before delivery. We will also make sure you understand how to operate it safely and efficiently, offer maintenance tips, and provide skilled factory trained and authorized maintenance. You will NOT find this level of service at the big-box store that has a few pieces of equipment beside their front door and little or no expert assistance with your purchase. 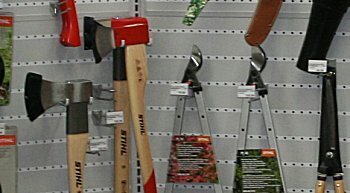 See our Stihl Line: You owe it to yourself to stop in and visit with our trained staff about the Stihl line. Don’t accept anything less than Stihl quality backed by the friendly folks here at Kramer Ace Hardware. We stand behind everything we sell and can match you with the right equipment to get your job done right.